Pressure transducers used in industry today take on a rather typical appearance. A round, tubular stainless steel body with a pipe fitting on one end and a cable coming out of the other end. Stainless is used because of its high strength and resistance to corrosion. Starting at the pipe threaded end, the opening or port has a stainless steel diaphragm inside that protects the sensor element from the media being measured (i.e. water). As we continue our journey through the transducer we come to the other side of the diaphragm where one side of the sensor element is. The actual element is a strain gauge; that is, a resistive element whose resistance changes with the amount of strain placed on it. This variable resistor forms one leg of a bridge circuit. The other side of the strain element is the reference port that the measuring port is compared to. All transducers have two sides; sometimes the other side has its own pressure connection and the device is called a differential pressure transducer. Further on in our voyage, we come to small circuit board. The two voltage out points from the bridge circuit are fed to an amplifier that changes the very small voltage into a 0-5V signal or most commonly to a 4-20 mA signal. This signal is fed out the cable (sometimes along with a vent tube) which finishes our voyage. To communicate the amount of pressure requires the use of an agreed on scale and convention. Just as the conventions and units for temperature are referred to as Fahrenheit, Centigrade or Kelvin; industry uses PSID, PSIA, PSISG and PSIVG notation for pressure. PSI (Pounds per Square Inch) is the pressure unit while the last letter(s) refers to the convention used to measure the pressure. You would use PA( Pascels) units instead of PSI in the metric system. By nature, pressure is the difference between two points or ports. Pressure between two ports (or pipe connections) is differential pressure. A designation of 10 PSID means 10 Pound per Square Inch Differential. If one of the ports is a vacuum, it's convention is designated absolute pressure. When you see 30 PSIA, it means 30 Pounds per Square Inch Absolute. Connecting one of the ports to atmospheric pressure lets us measure what is called gauge pressure. This is the scale most water people will see because it easily converts to "Feet of Water". You will see it printed on a pressure gauge as PSIG. To complicate matters further there are really two different gauge pressure conventions; sealed gauge and vented gauge. Sealed gauge pressure measurements are made by connecting one of the pressure ports to a sealed chamber that has atmospheric pressure in it (written PSISG). The problem with a sealed gauge pressure scale is, that the same number of "Feet of water" will read differently depending on the local barometric pressure. This can cause readings to fluctuate as much as 4 feet of water! If the pressure units are noted as PSIG (PSI gauge), it is a good bet that it really reads PSISG (PSI sealed gauge) instead of the better PSIVG (PSI vented gauge). An example of how the sealed gauge convention can cause problems may help. Lets imagine a clear well 10 feet deep. Imagine further, that we calibrate a stop point one foot from the top on a high barometric pressure day. On the next low pressure day the clear well will over flow! The solution is simple-use the Vented Gauge convention (written PSIVG). The vented gauge convention compares the pressure to a local "vent" open to local atmospheric pressure thus eliminating any changes with barometric pressure changes. Transducers are built to measure only one convention at a time (with a few exceptions). When purchasing a transducer you must be sure to order one that will measure using the correct convention for your purposes. In the water industry that will almost always be PSIVG. A submersible vented transducer is easily recognized by the small tube that is in the cable with the wires. One other note. Some manufactures will claim that the jacket of their submersible cable will act as a vent tube. The reality is if the fitting that keeps the water from entering around the cable entrance is tight enough to keep out water it also restricts air movement through the cable. PSIG, as an industrial standard notation, is supposed to mean PSIVG. But unfortunately companies put PSIG on their transducers when it is a 'sealed' type. A sealed gauge unit compares the port pressure to an average air pressure while the vented type compares the port pressure to local air pressure via the port. Always ask if the transducer is of the vented or sealed type before buying. The output of a transducer is naturally a voltage. Most water applications convert the voltage to a 4-20 mA current loop. This provides a good loss-less, low impedance connection to control equipment. By sending the signal as a current there is no error from voltage drop introduced from the resistance of the wire what ever the length is. Most applications call for a 0-5 VDC, 4-20 mA or a mV output. But if necessary, transducers can be ordered in, 0-10 VDC, 0-2.5 VDC, 0-100 m, ratio metric mV/V (custom ranges are available at a price). To connect a 2 wire 4-20 mA transducer take the + (red) lead of the transducer and connect it to the + terminal of the power supply. Connect the - (black) lead of the transducer to the + input terminal of the readout. Connect the - input terminal of the readout to the - terminal of the power supply. To connect a 3 wire Vdc output transducer connect the - excitation (black) lead of the transducer and the - terminal of the power supply to the - input terminal of your equipment. Connect the + lead (red) of the transducer to the + terminal of the power supply. Connect the signal lead (white) of the transducer to the + input terminal of your equipment. What does 4-20 mA mean? The term "4-20 mA" literally means 4 to 20 milli-amperes. A signal of zero would be sent as 4 mA. For example, if there was no water in your tower, or you had the transducer disconnected, the transducer would transmit 4 milli-amperes written as 4 mA. The 4 mA current represents zero gauge pressure. By sending a zero pressure as 4 mA instead of 0 mA we avoid confusing a bad connection (0 mA) with zero pressure (0 mA). A Full Scale Output (FSO), as in 100 PSI applied to a 100- PSI transducer would cause 20 mA of current to flow. How much current would flow if we apply halve of full scale or 50 PSI to a 100 PSI transducer? The current ranges from 4 to 20 mA or a 16 mA span. Halve of 16 mA is 8 mA plus the 4 mA at zero gives us 12 mA. For some applications, it is important to know how far the water is from the top of the tank or the surface of the ground. If specified by the customer, the factory can set the transducer so that zero pressure reads full scale electrical output and maximum pressure reads zero output. A 100 PSI transducer with a 1% FSO rating would read within 1 PSI or about 2 feet of water. There are two kinds of tolerance: tolerance due to changes in temperature (thermal error) and tolerance at a given temperature (static accuracy). It can be seen, by the above example, that over a wide temperature range thermal error will dominate the total error. Do you need accuracy or resolution? Also remember that a submersibles are mostly used at small depths -- 10-20' and 1% of 20' is only 2.4"! Ensure no damage occurs to the cable as cable damage represents the most frequent cause of transducer failure. Good cables are quite flexible and care needs to be taken when bending the cable that you do not crimp the vent tube inside. Do not bend the cable tighter than a 1 inch radius. If you require a compression fitting to secure a Tefzel or polyurethane jacketed cable as it enters a junction box don't use more than 15 ft/lb. Or you may damage the cable or pinch the vent tube. One of the better ways is to suspend the submersible transducer in a perforated 1 1/2" or 2" PVC pipe or attach the transducer (using a optional 1/2" M NPT fitting) to a rigid conduit. Submersible pressure transducers can be attached to a rigid conduit and the cable run through the conduit. Submersible transducers can be fitted with a 1/2" NPT male conduit fitting where the cable exits the transducer. This fitting then mates with standard rigid conduit. You could also use an optional bracket to clamp the transducer to a fixed object (i.e., wall, ladder, step). 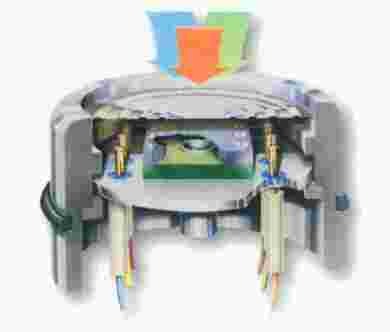 Suspending the transducer without any protective pipe or attachment device can invite damage. Installers often use cable hangers (Chinese finger grips) used for hanging electrical cables (available from most electronic supply stores). The cable hanger slides onto the cable and can be positioned anywhere on the underwater cable by pushing the ends together. Once positioned, the cable hanger provides a snug grip on the underwater cable. When mounting the transducer in a well casing, the cable hanger can be secured to a eyebolt attached to the well plate or the side of the well casing. The cable hanger loop is then secured to the eyebolt. In still wells, the loop-end of the cable hanger can be attached to an eyebolt mounted in the still well shelf. Although it is possible to screw a transducer directly onto a pipe, it may not be a wise decision. For an example, in water systems you can think of the water pipes as the best ground available to the power grid with miles of buried metal pipes. Also think of a spherical shaped water tower. Your physics teacher would tell you that a water tower resembles a Van de Graaff generator in its shape and ability to build up a large static charge before dramatically discharging. Currents of up to 200,000 Amperes are not uncommon. The local ground potential will change dramatically compared to the electric utilities ground. Even if the transducer survives it may be bad news for the control equipment that it is attached to. If the pressures and media allow you to, it is best to connect using a nylon tube of several feet (to provide a high impedance water channel). Place the transducer body in a short length of PVC pipe to insulate it from 'ground sources'. The most important thing to remember in applying transducers is to avoid introducing a 'ground source' where it does not belong. Connect the transducer with 10' of 1/4" or smaller nylon tubing. Place the transducer body in a short length of PVC pipe. Keep the transducer up high where it will not become flooded. The maximum length of cable used with pressure transducers dependent upon the type of electrical output of the transducer. For a 0-5 VDC output, a maximum cable length of 100 feet is recommended as voltage outputs are prone to interference. The 4-20 mA outputs can be transmitted much longer distances depending upon such factors as wire size, length of wire, power supply and voltage requirements of any devices to be powered. The 22 AWG conducting copper wire in the polyurethane jacketed cable has a resistance of 16.45 ohms per 1000 feet. Using Ohms Law (E = IR) (E = voltage, I = current and R = resistance), one finds that a 20 mA signal requires .329 volts to drive it along 1000 feet of 22 AWG copper wire (E=16.45 x .020). To find out how much voltage is required to drive 4-20 mA signal 10,000 feet, just add the minimum excitation voltage to the voltage drop offered by 10,000 feet cable (10 x .329=3.29). The resulting voltage requirement is the minimum excitation voltage + 3.29V. If you also have other loop-powered instrumentation on this circuit you will have to add their voltage drops in order to find the minimum supply voltage. Often the cost of diagnosing and servicing a control system because of a failed transducer is many times the cost of the transducer. I have quoted transducers and lost the business for the difference of a few dollars only. Later, the customer comes back with tales of electronic failures, excessive thermal drift or leaking cables. Sometimes the devices just don't meet the claimed specification. Turns out that the manufacturers of poor transducers seem to thrive - they make more money because they are always selling replacements units. This is one of the reasons we got out of the Transducer business. Use of 'dry air' transducers on compressed air lines can be a big mistake. Condensation and compressor oil can ruin these transducers. If you are not sure that the media is a dry gas use an all media transducer. The most common cause of submersible failure is moisture on the backside of the transducer. This is most often due to poor quality cable jackets and/or seals to the transducer. We won't sell the SO cable jackets as a submersible cable because the rubber degrades over time, and can become porous. SO jacketed cables are meant for extension cords not underwater use. The cable to transducer seal is also very important. It is easy to make a seal that last for a few months but quite a different story to make one that lasts for years.